The other day my grandson was making “pancakes” out of silly putty at the kitchen counter. The moment I turned my back I found him making pancakes on the Living Room carpet! I was horrified at the mess on my new rug, but I didn’t panic. His poor little eyes almost popped out when he couldn’t get the putty up from the carpet! I tried to remove the putty with a paper towel and another cloth towel with no success. It just ground in more. Don’t you love happy, simple endings to potential cleaning disasters? Recently, I was in Florida to take care of my 89 year old father who was suffering from a life threatening and potentially contagious ailment and I was very concerned about hygiene and sanitation for his apartment and to protect me from getting sick. There have been over 80,000 new chemicals introduced into our environment since 1950 and only about one third of them have been tested to be safe. The medical field has been seeing an increase in medical problems especially asthma and other respiratory problems which are thought to be caused by chemicals in our homes, homes that are built tighter, and hence, chemical residues are being breathed. Asthma diagnoses have increased 600 % since 1980. The three top toxic products in our homes are fabric softeners/dryer sheets, oven cleaner, and drain cleaner. Kathy Marsh, former owner of The Urban Homemaker and I were talking about this and she mentioned to me that her son was released from his pulmonologist and nebulizing treatments after she went to chemical free cleaning six years ago. About 15-20 years ago, researchers in Norway found that microfiber products were an effective alternative to traditional chemical antibacterial products because they removed 99.9% of the surface bacteria. 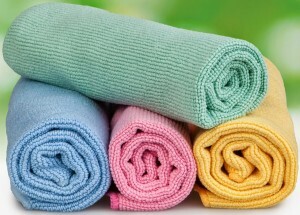 Norwex Microfiber products were originally used exclusively in hospitals because they didn’t contribute to an ever escalating set of resistant bacteria. Commercial floor care products, no matter how safe or non-toxic they may be, all leave sticky residues on the floor that work like a magnet to attract dirt. A product that doesn’t leave these residues will naturally make it easier to care for your floors. Norwex Microfiber products do not disinfect surfaces but REMOVE bacteria from smooth surfaces (including floors) and prevent the transfer of germs to your hands while cleaning and eliminate cross contamination. Norwex microfiber products contain a patented silver agent that prevents and kills bacteria growth, is safe to use, inhibits odor development and does not affect the performance of the microfiber. My favorite Norwex chemical–free cleaning products are the _Enviro Cloth, the Window Cloth and the Superior Mop System. These three items will clean your whole house including the bathroom, toilet, shower, sinks, windows, refrigerator, counters, computer screens, flooring, and much, much more.